Baseball in October, does it get any more exciting than this? As of right now, from a Yankees fan perspective, there are positive and negative points that can be said as of now, October 8. First, the positives begin with a good first game on Tuesday by the Yanks in Los Angeles, winning 4-2. The Yankees collected six two-out hits over the first two innings to jump out to an early 3-0 lead, and Mike "the Moose" Mussina pitched a strong five innings to collect the win. This was very important for the Yankees, as the Moose was starting to pitch after injuries, and has been inconsistent throughout the year. This looked like the old Mussina that won big games for the Yanks, as he did Tuesday night. Robinson Cano, who is in the picture to the left up top,(Rookie of the Year for the AL? Does anyone agree with me, or can you think of a better candidate than him?) hit a three run double to set the pace for the rest of the game. Mariano Rivera unfortunately let up a run in the ninth to give Yankees fans a scare, but pulled out his 33rd postseason save to preserve the win. Also, a few short days later, the Yankees arch nemisis, the Boston Red Sox, were SWEPT by the Chicago White Sox. Their hopes as repeat World Series champions were finished! It was humorous to see the video footage at Yankee Stadium the response by Yankee fans to the final out in Boston to end their season. Everyone was cheering! It was also announced that Jason Giambi was named the AL Comeback player of the year. You can read more about this story here. However, the next two divisional playoff games did not fare so well with the Yanks. Errors and poor hitting with runners in scoring position keyed the Yanks loss. This was also a game that the Yankees were winning and let the Angels come back to win 5-3. This game could have been the turning point in the series, as the Yanks would have taken the two game lead back home into the Bronx and used that momentum to hopefully win game 3 and end the series. However, the loss meant they would have to work harder to win a spot in the Divisional championship. 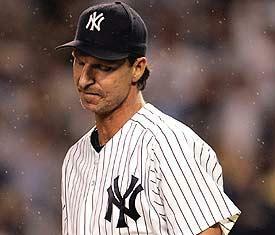 Then in the rain on Friday night, the Big Unit, Randy Johnson, who is pictured up at top to the right, was supposed to give the Yankees the edge in the post-season. However, his usual style of hard throwing strikeout pitching was way off, and the Yanks were losing 5-0 early on in the game. According to www.yankees.com, "Johnson's subpar outing came as a surprise to the Yankees, who had watched their ace dominate over his last eight starts, going 6-0 with a 1.92 ERA. "Afterwords, usual reliable, strong pitchers Aaron Small and Tom Gordon also could not hold of the LAA offensive. The Yanks scored four runs in the bottom of the fourth to get a rally going, and were winning 6-5 in the bottom of the fifth after Bernie Williams sac flied to score Robinson Cano. However, the Angels answered back with a pair of runs in the sixth against Small to regain the lead 7-6, and never looked back. By the time the rain soaked game was over, it was LAA 11, NYY 7. This causes the Yankees to be in a one game elimination from the divisional series playoff, and an end to their season. The Angels are up 2 games to 1, and the first team to win three games will move on to play the Chicago White Sox for the American League Championship. Tonight's game 4 at New York was post poned due to the heavy rain, and will be played on Sunday at about 8 p.m. This is good for the Yankees because they get to rest their players and bull pen, which they need, and hopefully regroup and put together a game plan to even the series and keep their hopes of a World Championship alive. If they lose on Sunday, their season is over. However, this is also good news for Chicago, as they also gain another day of rest before they being their own quest for the championship. On Sunday, Shawn Chacon will pitch against Jarrod Washburn. This will definetly be the biggest game of the Yankees season. 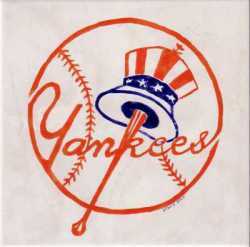 I hope everyone is rooting for the Yanks! On some side notes, to respond to Eric and Patrick, unfortunately, Philadelphia sports teams do not live up to their hype and disappoint their fans again :) , and on my survey, 70% of you thought the Yankees are going to win the World Series this year. Good work guys! Jason Giambi definitely deserved to be named the comeback player of the year in 2005. Few (probably no) players had to deal with the controversy that surrounded him over the past year. As if being caught using steriods was not bad enough by itself, he had to deal with it in New York. He put up Giambi-like numbers similar to those from his days in Oakland when he won the AL mvp a few years ago. Hats off to Jason for his accomplishments. Now about these Yankess. I am a National League fan so I don't follow the Yankees/Red Sox as much as most, but I was a little upset when Boston lost in the ALDS. I don't know anyone who would not like to watch a rematch of last year's ALCS. I'm going to have to be that guy and root for the Angels to pull this one out because I have always enjoyed cheering for the underdog. We will have to wait and see what happens in game 5 to find out who is moving on to play the White Sox. Robinson Cano has put up great numbers this season as a rookie. It has been fun to watch his progress throughout the season. I'm sure it is even more exciting to you since you got to see him playing in the minor leagues when you worked for Trenton Thunder. My vote for AL Rookie of the Year is Robinson Cano. I was very glad to see the Boston Red Sox get swept by the Chicago White Sox. It was good to know there would be no repeat of last year. I would feel a lot safer in the playoffs without the Red Sox in them. Giambi definitely deserves AL Comeback player of the year. He put up remarkable numbers after a very poor start and a very poor season last year despite his illness.